David Matranga has been working as a voice actor for over 15 years voicing over 100 roles. 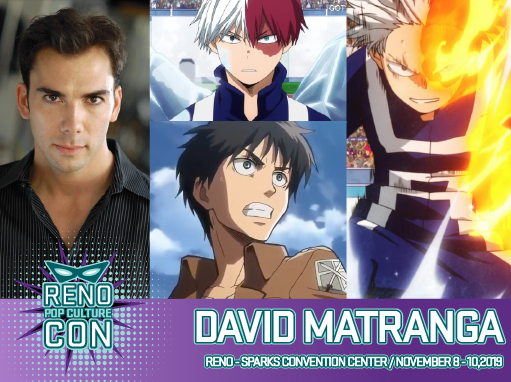 From his first lead role as Orphen in Orphen all those years ago, to more recent work in the popular simuldubs, voicing Shouto Todoroki in My Hero Academia, Bertholdt Hoover in Attack on Titan, Kiota in Black Clover and Luke in Garo Vanishing Line, David has been featured in many of the most well known and beloved shows in anime. He has worked for studios such as ADV Films, Funimation, Sentai Filmworks, Sound Cadence Studios and Okratron 5000. He recently completed the first season of Golden Kamuy playing Tanagaki, and the reboot of Saiyuki with Saiyuki Reload Blast where he stepped back into the shoes of the gun-toting priest, Genjo Sanzo, one of his first lead roles all those years ago. The last few years he has voiced the roles of Ushio in Ushio & Tora, Junker in Planetarian, Silva in Monster Hunters Stories: Ride on, Subaru in Brothers Conflict, Usui Takumi in Maid Sama and Wave in Akame Ga Kill, to name a few. Matranga reprised his role as Briareos in the recent CG-animated Appleseed Alpha and Appleseed XIII: Tartaros & Ouranos films. He also starred in the new Netflix Captain Harlock (Space Pirate Captain Harlock) CG film for its North American theatrical run. His career since 2014 has covered a lot of ground overall. He was the handsome pink-haired doctor Akari in Karneval, Rio Satomi in Hakkenden: Eight Dogs of the East, the Majestic (but not very nice) Prince Jiart, cyborg builder Dr. Easter in Mardock Scramble: The Third Exhaust, and Tomoko’s annoyed brother Tomoki Kuroki in WATAMOTE. Other popular titles include: Tomoya in Clannad, Hideki Hinata in Angel Beats, General Rico in Starship Troopers: Invasion, Halo Legends, Briareos in Appleseed, Appleseed Ex Machina, and Appleseed The Series, Saiyuki, Orphen, Le Chevalier D’Eon, Gilgamesh, Colorful, 5 Centimeters Per Second, High School Of The Dead, and Super Milk Chan to name a few. Genjo Sanzo (Saiyuki), Hisashi Igo (High School of the Dead). His more popular early anime roles include Orphen in Orphen and Sanzo in Saiyuki. In addition to his prolific list of anime voice work, he also works consistently in the video game and commercial voiceover world, and still spends much of this time on theatrical stages around the country. Fun Fact: He also did the motion capture for the role of General Rico in both animated Starship Troopers films and the character of Briareos in CGI animated Appleseed Alpha. For updates and fun rants, FOLLOW HIM on Twitter @davidmatranga1 and IG @matrangadavid.